Designed for Windows & Mac computer enthusiasts and gamers who need large amounts of storage, the Black Vortex 4-Bay USB 3.0 JBOD Enclosure from Icy Dock supports up to four 3.5" SATA III 6 Gb/s drive bays and connects to your host system using either its USB 3.0 port at speeds up to 5 Gb/s, or its eSATA port at speeds up to 3 Gb/s. Using the 2.5" to 3.5" HDD/SSD EZ-Convert converters, this JBOD enclosure is also able to support 2.5" hard drives and SSDs. A built-in 120mm fan helps keep the enclosure cool and is also illuminated with a blue LED, while integrated fan and LED brightness controls allow users to configure the fan speed and LED brightness to their liking. Available fan speed and LED brightness controls include high, low, and off, and the fan can also be replaced with an aftermarket 120mm fan so long as it has a 3-pin connector. A removable dust filter helps keep things clean and may be removed for cleaning. When it comes time to replace or swap out a drive, the included EZ-Grip handles allow quick removal of drives from the Black Vortex, after which they may be inserted into a compatible docking station, without needing to remove the EZ-Grip handles. The Black Vortex 4-Bay USB 3.0 JBOD Enclosure includes six EZ-Grip HDD handles, screws, a power cord & adapter, an eSATA cable, and a USB 3.0 cable. It is protected by a limited 3-year warranty. Box Dimensions (LxWxH) 11.6 x 8.7 x 7.6"
Black Vortex 4-Bay USB 3.1 Gen 1 JBOD Enclosure is rated 4.5 out of 5 by 8. Rated 5 out of 5 by Anonymous from Easy Buy - Cool, Quiet 4-disk Enclosure I moved my two mechanical hard drives out of my small case to reduce noise and temperatures. They were easy to pop onto the drive sleds and into the SATA backplane. I added an additional large drive for backup purposes. The enclosure is stored in a closet around the corner from my desk with the initial plan to keep it there for reduced noise. But I have to admit that with the fan on low, it is inaudible to me when placed under my desk. The temps on the drives are quite reasonable as well. Rated 5 out of 5 by Stewart from Very happy with unit. I am very happy with this purchase. It was super simple to install. Just attach some locking tabs to your drives and slide them in. I used the USB connection and Windows instantly recognized them. As with any plug n play, Windows assigned drive letters automatically but you can then change them and they stay put. The only thing is that the drives do show up in the remove hardware list so you need to be careful to not accidentally do that but that is no big deal and i would imagine all devices like this work that way. I do have to add that it does look really cool. Rated 4 out of 5 by yo-yo from Works as a simple external enclosure! Overall I am pleased with the enclosure. It is a simple plug and play type situation. Just attach the caddies (requires screw driver) and slide into place. Plug it in and you have massive storage, its that simple. Fast speeds over both USB 3.0 and eSata. The ability to turn off the fan or the lights is nice. The fan does not produce significant noise, and would not be noticeable (even on high setting) with all four drives active. The box includes all the necessary cables (both a USB 3.0 and eSata cable) which is nice. The biggest negative for the enclosure is that the fan is not particularly effective. With the enclosure fully populated there is not much room for airflow. And on top of that, the design of where the fan connects to the enclosure leaves gaps around the edges. As a result much of the airflow from the fan does not flow over the drives. Rated 3 out of 5 by Rowdy from Possibly a good unit for you I am giving this JBOD enclosure 3 stars only because it just wouldn't work with my system. I don't think it was a problem inherent with the unit, I think my system set-up just didn't or wouldn't communicate well with it. After replacing a JBOD enclosure that I had with this unit my system would crash once a day at least and on the final day before i sent the unit back my system crashed multiple times and one installed disc was corrupted. The unit itself is solidly built and the fan on the unit is as quiet as it gets. Not to mention the fan is replaceable which my other one was not. In general I think if I had been starting this from scratch and not trying to use existing drives I might have been able to get the unit to work. But I can't say for sure. Either way it was just not going to work for me. But I think it could be a really nice unit for someone looking for a JBOD. Rated 5 out of 5 by Walter from Great Value This enclosure is easy to set up, has a small desktop foot print, and quiet to run. You can also dim or turn off the blue LED glow if you don't want it. What's not to like for the quality of the materials at a inexpensive price. Rated 4 out of 5 by Matthew from Doing the job I bought it for. I haven't had the dock for long so time will tell for durability. I am happy with it though. It is doing the job it was designed for well. 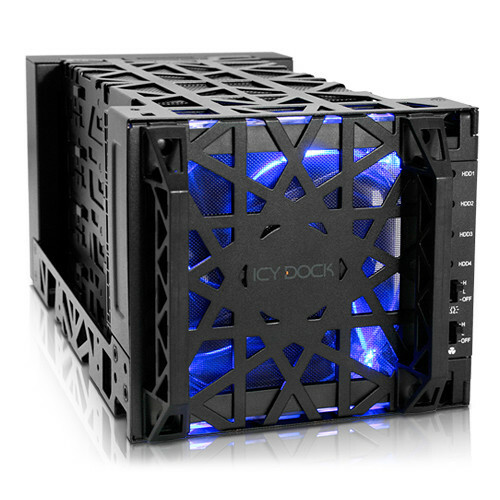 Rated 5 out of 5 by Mark from Icy Dock Black Vortex 4-Bay USB 3.1 It's really great to have four drives in one package. This replaces four USB drives with individual data cables and power supplies. Rated 5 out of 5 by Walter from Perfect Excellent way to add four external hard drives without breaking the bank. Will this enclosure also do RAID on a Mac, or is it JBOD only? Is it possible to remove drives from external enclosures (I have WD and Seagate drives) and put them into this enclosure, would I need to buy new drives? I would not consider it as supporting hot-swap. If other drives in unit have concurrent activity and you add or remove from a different bay, that will be interrupted as it seems all bays drop out momentarily as the device is re-scanned to pick up the changed. Never an issue if drive changes are done while PC is down or before unit is connected to PC. Does this work on a Mac Pro? Does anyone know the transfer speeds specs on this? Yes it does, up to 5 Gb/s speed and backward compatible with USB 2.0. The description says USB 3.1 but the picture shows USB 3.0. Which is it? I have several of these purchased latest in March 2018. All have e-Sata connector and USB 3.0 clearly labeled as such (type B on unit, type A on PC end of supplied cable).